Trials from March 2014. Colourways were more settled by summer 2014. Trials similar to Jazz Nuvo were created at the very start of production at the new Arreton Barns studio in March 2014. Many colours were trialed before settling on the colourways listed below. It is reminiscent of the classic Jazz and its follow-up Jazzy. Brown, Orange and Monochrome (black and white) are known as trial colours. There were several trial shapes, but the following were available as the official range: skittle (32 x 8.5 cm and 27 x 7.5 cm); round vase (20 x 20 cm and 9 x 9 cm); lugged vase (22 x 19 cm and 11.5 x 8.5 cm); globe perfume bottle with curly stopper (13 x 10 cm and 11.5 x 8 cm); cased flattened paperweight (7 x 4 cm). 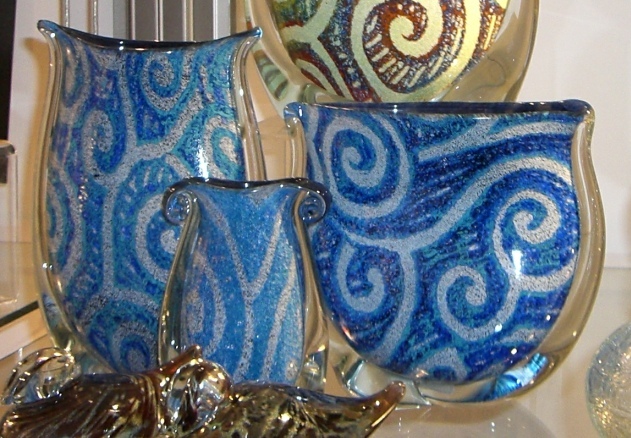 A selection of Jazz Nuvo Blue lugged vases on the shelves of the studio in September 2014.